Custodia portavaluta misura media The Currency Slab Bill Holder is perfect for holding not only your valuable or collectible currency but also the Silver Gold Bull Aurum! The holder features: Crystal clear hard plastic, Acid Free, Visibility from both sides, Precision fit two piece snap together design, Made from Polystyrene, Holds current size US bills, Perfect for the 1/10 g Silver Gold Bull Aurum Gold Wafer. 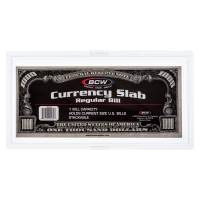 The Currency slab is a two piece precision fit holder that gives the highest level of protection while still allowing visibility on both sides. Use them to protect your collection today!